Home / Unlabelled / TERROR MOVIES - THE OLDIES! TERROR MOVIES - THE OLDIES! Uma dona de casa perfeita começa a suspeitar que sua adorável filhinha adolescente pode vir a ser uma assassina sem coração! 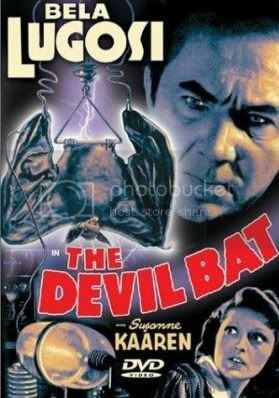 This low-budget thriller, boosted by Bela Lugosi, was one of the biggest successes for the poverty row Producers Releasing Corporaton (PRC). After the war, the studio tried to recapture this success by producing a non-sequel "sequel", Devil Bat's Daughter (1946), and a virtual shot-by-shot remake, The Flying Serpent (1946). Dr. Carruthers feels bitter at being betrayed by his employers, Heath and Morton, when they became rich as a result of a product he devised. He gains revenge by electrically enlarging bats and sending them out to kill his employers' family members by instilling in the bats a hatred for a particular perfume he has discovered, which he gets his victims to apply before going outdoors. Johnny Layton, a reporter, finally figures out Carruthers is the killer and, after putting the perfume on himself, douses it on Carruthers in the hopes it will get him to give himself away. One of the two is attacked as the giant bat makes one of its screaming, swooping power dives. Terrore Nello Spazio (1965) aka Terror In Space DVD Rip - TERROR NO ESPAÇO! In typical Bava fashion this movie has great visuals, atmosphere, and a great overall 'feel' of uneasiness. The story is very well done and ahead of it's time, and parts of it were later used (and referenced in) Alien. Two ships land on a mysterious planet after receiving a distress call, only it turns out it wasn't in distress at all... it was a lure so they can spring a trap. The bodyless aliens turn the crew against each other so they can take over their bodies, leaving the living to wonder who's on their side and who's been taken over by the unseen enemy. Star Odyssey DVD Rip - ODISSÉIA ESTELAR! A TERRA é atacada por um Vilão Intergalático e seu exército de andróides robóticos (simples assim). Return Of The Boogeyman (1994) - O RETORNO DO BICHO PAPÃO! Poor Annie every time she falls asleep, her dreams are haunted by visions of a faceless man committing unspeakable crimes. Just like a kid afraid of the dark, the Boogeyman has made her afraid to close her eyes. Annie soon realizes her hideous dreams are predictions. If she can harness this terrifying power, perhaps she can prevent the bloody slaughter she forsees, and track down the Boogeyman before his body count climbs any higher. On a dark night in the forest in 1871 an attractive woman in white is being led by an evil she cannot understand to rendezvous with The Alchemist. Her husband is racing against time, fighting the tangled woodlands tring to prevent her soul from being stolen. He arrives just as the evil forces are about to engulf her. Using all his strength he attempts to destroy the alchemist but destroys his wife instead. The Alchemist condemns him to eternal damnation, to walk the earth; an animal in search of a lost soul. It is 1955 now and the reprisal of The Alchemist must be avenged. Before hell is set loose on the world. Directed by Charles Band. In a final and epic battle in the thrilling sequel to the now classic "Barbarian Queen", Althalia, leads a revolt of peasants and female warriors against the wicked ruler, Arkaris, to regain her throne.